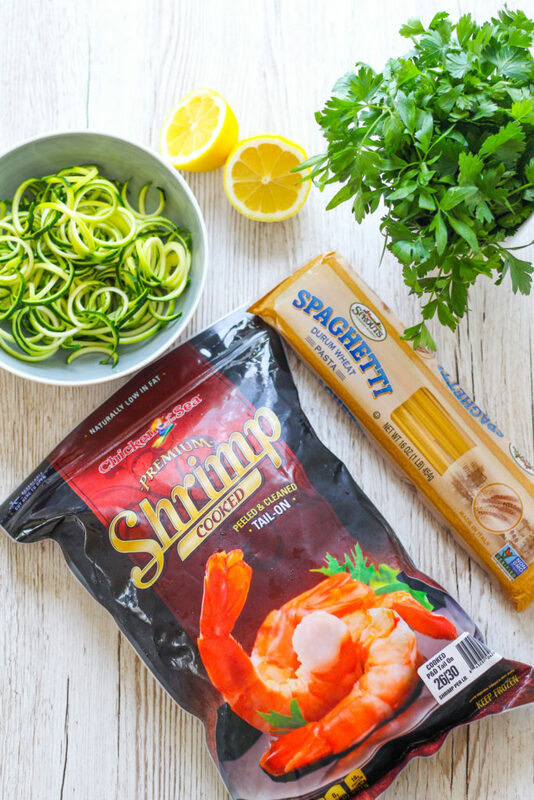 Spaghetti, zucchini noodles, white wine, garlic, butter and shrimp make this delicious lightened up shrimp scampi! Serve this for dinner tonight and enjoy the delicious taste of shrimp and pasta. Thank you to Sprouts Farmers Market for sponsoring this post. All opinions remain my own. Thanks for supporting brands that make Zen & Spice possible! Happy Monday, everyone! I hope you had a fabulous weekend. If you are a reader who celebrates Easter, I hope you had a fabulous holiday. I’m not religious, but I still love the happiness, love and springtime fun that comes along with celebrating spring holidays. I actually spent Saturday at a mindful eating seminar for the local dietetic chapter, and afterwards, we had the privilege to attend a free yoga class! I hadn’t been to a yoga class in over a year and a half. Lately I’ve been thinking about getting back into it, and Saturday’s class totally revitalized my love for yoga. Any fellow yoga lovers out there? Today I’m bringing you a recipe courtesy of Sprouts Farmer’s Market! A couple weeks ago, I did a seafood recipe food demo at their Denton, Texas location. We had a BLAST and the crowd loved the recipes– this one included! I also demo’d my famous salmon patties and those were also a hit. Sprouts has really great seafood– fresh and frozen. For this recipe’s purpose, I used frozen pre-cooked shrimp so the meal could be thrown together in minutes. One of my favorite ways to enjoy pasta is to mix it with spiralized veggies. This recipe combines both spiralized zucchini noodles (zoodles) with regular pasta. I like to mix half and half because lets be honest, a bowl of zucchini noodles isn’t going to keep me full until my next meal. Pasta is a great source of energy for my both my body and brain. And pasta is probably my favorite food (besides cheese, and mixed with cheese, even better). I took my family’s shrimp scampi recipe, made it lighter, and added zoodles. It’s lighter than traditional scampi recipes– I only used two tablespoons of butter in the whole dish. With plenty of sweet onion, garlic, lemon, parsley and crack black pepper, this dish boasts huge flavor! This dish can be thrown together in minutes– the spaghetti cooks quickly, and the scampi sauce and shrimp comes together in minutes. If you use pre-cooked shrimp, the prep time is even faster. 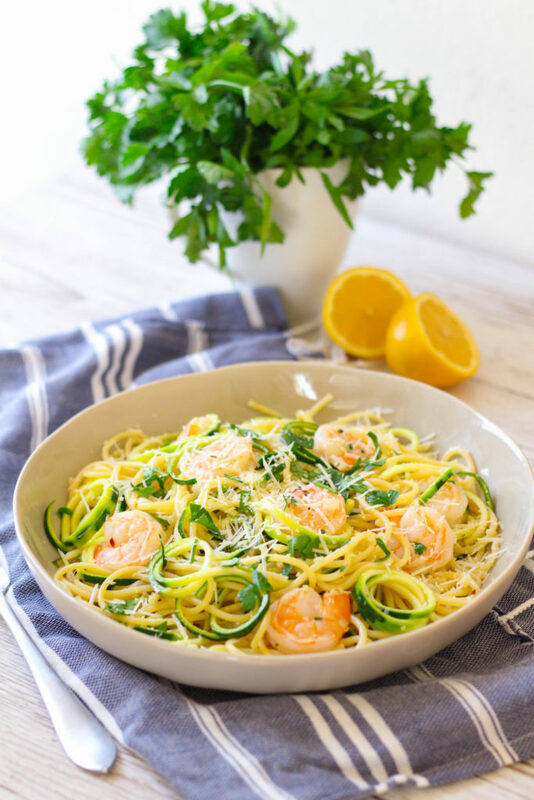 Here’s the recipe for Shrimp Scampi with Zoodles! Dig in! Boil the spaghetti according to package instructions. Drain and set aside in a large bowl. 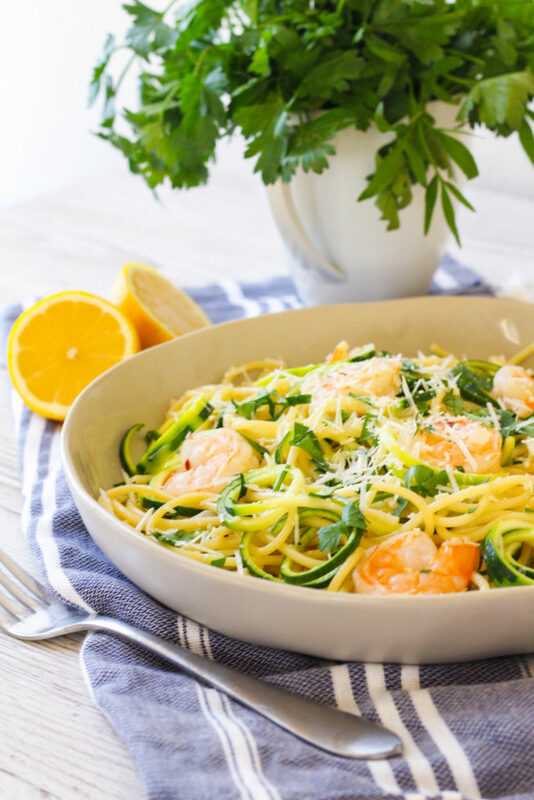 Use a spiralizer or Julienne peeler to create zucchini noodles, set aside. Heat the olive oil and butter in a large pan over medium heat. Add the onion, garlic and red pepper flakes. When the onion is translucent, add the shrimp and cook until pink. Add the wine and let simmer for 3-4 minutes, stirring occasionally. Remove from heat, add the parsley and toss to combine. Add lemon juice and black pepper. Pour the shrimp and sauce over the spaghetti in a large bowl. Add the zucchini noodles and toss until the zucchini wilts slightly. This looks delicious! Can’t believe I haven’t made myself zoodles yet. You should!! They’re so easy. All you need is a julienne peeler, or better yet a spiralizer! I’ve never made zoodles, but this is the second recipe I’ve seen this week that calls for them. Do I need a special tool? Where do I get one? I had to read what zoodles were lol. I’ve made a similar dish before. SO good! Can’t go wrong with shrimp. Yum! I just bough some zucchini to spiralize up, I’ll be stopping by the store for some shrimp now! :) Looks delicious! 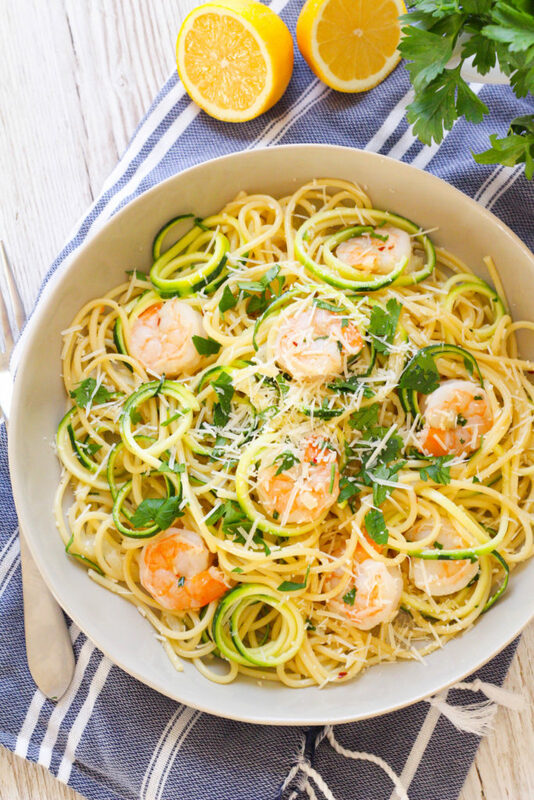 This dish totally reminds me of childhood :) I love the garlic and butter with shrimp for scampi! 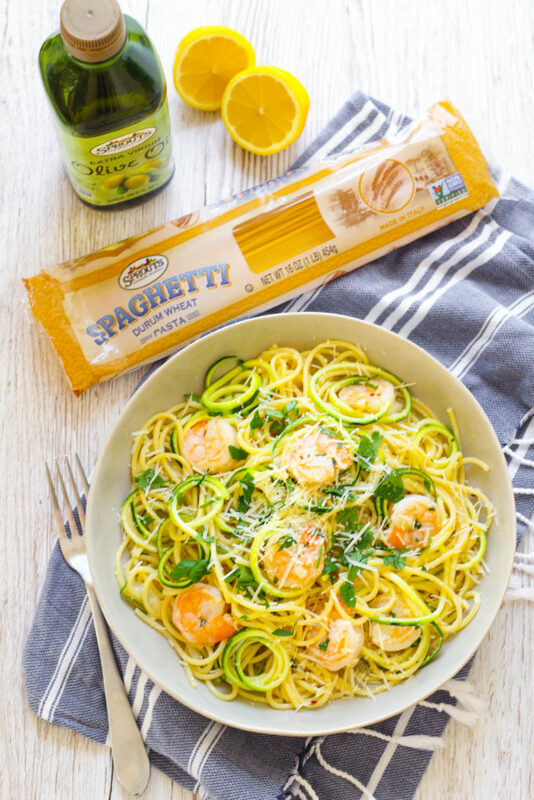 Great idea pairing noodles with zoodles. I’m going to have to try that!